You experience a plan with actions to engage people in civic, civil and economic activities. You gain access to resources and opportunities. The processes to achieve access were best described in a triangle to show growth from Work or value added in the center. You develop relationships with people with expertise, resources in one corner. You organize and communicate to grow the next corner and gain access to opportunities at the last corner. We packaged the knowledge that the top half percent of successful people use daily. The knowledge of owner families is also part of the ebio process and both spheres of knowledge are transferred to the participants using our natural human curiosity to observe and imitate. Ebio built the relationships, engaged the working structures and packaged the processes required to bridge this gap we identified. Individuals that has been through the ebio process are better are able to take the grand service education offers. The ebio process causes individuals to be productive – to grow the economy. Agents recruit the individuals going through the process. An agent must have direct access to the ward for the area in which they live. Agents engage individuals on the ground and facilitate the process of forming these individuals into work groups. The groups use the World Wide Web as their main medium of building their personal portfolios; these portfolios are communicated via their personal websites. Ebio groups also have access to ebio resources with the assistance of implementers and facilitated by the agents within the LocalGlobal co-operative. Implementers have direct access to mentors and are focused on specific areas, for example Bongani Khumalo is an implementer for the area of “Plan your business” Selvin Munusamy is focused on the area of strategy. Implementers serve the groups with their personal area of expertise and give access to the mentors behind them. 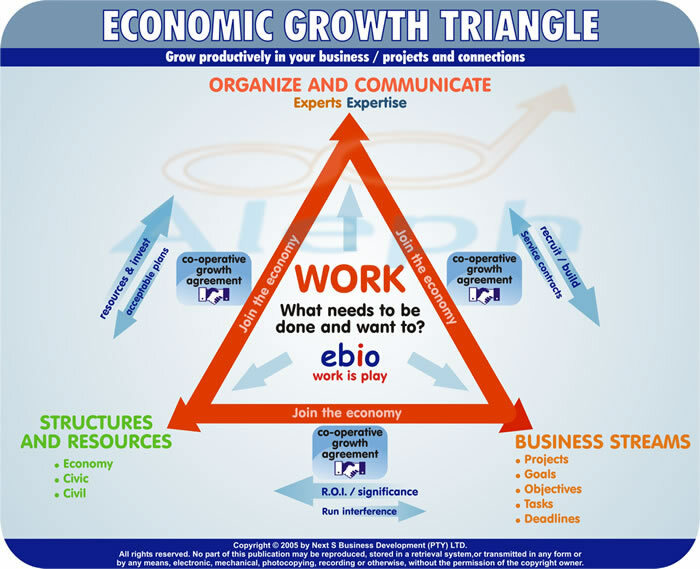 The work triangle implements the ebio process. Work is in the centre, what needs to be done by the individual to make possible the building of relationships? What work is required for the successful communication and flexible organizing of their growth and expanding abilities? What is the right work to do when engaging running business streams, when productive and building the economy? The right work remains the focus. A next part of the work triangle is the co-operative agreements.